As you know, members of my guild make bags and then the rest of the members bring small gifts/goodies with which to fill them. This time we had a new position for which to make a bag. The Member-At-Large position was somewhat undefined, so there was some discussion about whether the job that had been done was bag worthy. I felt bad not giving a bag to a board member when, despite her work, everyone else on the board was getting a bag. 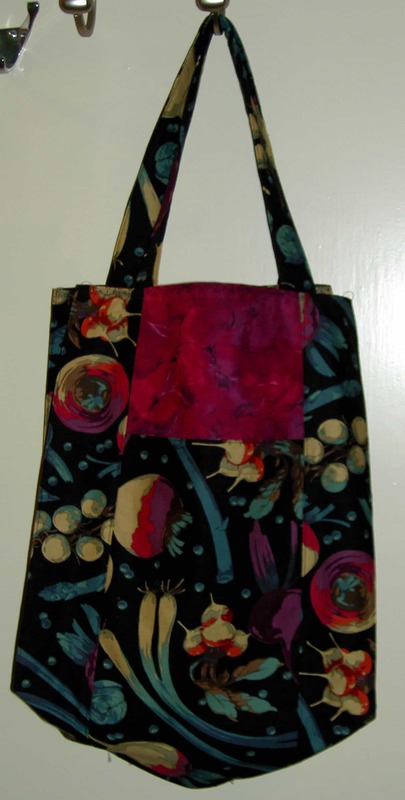 As a result, I pulled fabrics and made a Jane Market Tote. The hardest part of these bags is the cutting. I always forget how many pieces I need to cut. I take responsibility, because I have such trouble understanding patterns. I’d love a system where cutting was uniformly described across all patterns. 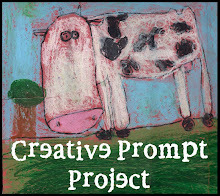 If wishes were horses…. Still, once cut, this bag goes together easily. I add interfacing to the outside pieces, which makes the bag pretty crisp, though still foldable. I also set the straps in the top seam rather than sewing them to the outside. This means that three seams cover the straps and provide security. I thought of this bag. It was, after all, almost done and meant I didn’t have to start a new project. Perfect. I started this bag before I started having machine problems. It was actually the straw that broke the camel’s back. I try not to hold that against it. Regardless, I had some decorative stitches to rip out. At Sew Day, Kelly did the job for me while I did a job for her. Then I just did another decorative stitch with the backup machine and finished it. Making this tote bag was great and adding the decorative stitch was kind of a shot in the dark. The other variable was that my backup machine allows me to resize the stitches as well. I haven’t played much with that option, but it introduces a whole additional level of options to my choices. I dove in and sewed the last bit, then gave it to Mom who was thrilled. I might make something else, if I have a chance, since the auction isn’t until December. What I would love is to make something that would blow their socks off and have people fighting over. I would be a hero. A quiltmaking hero and that would be awesome. **My mom is Greek Orthodox and I have no idea if their priests have to take a vow of poverty. I do know that their salary has to come from the congregation and that is daunting. I don’t see the priest getting $90k per year. I went back and forth about whether or not I should post this on my blog before the BAMQG party, but I have so little to post these that I decided to go for it. I don’t know all of you as well as I would like, but I don’t think the recipient is a reader. Perhaps she will be after receiving the gift. I agreed to make a Secret Santa gift for the BAMQG Holiday Exchange. It was hanging over my head, so I decided that Saturday would be the day to start. I actually cut out all of the pieces on Friday night and put most of the interfacing on as well, so the sewing went pretty easily. 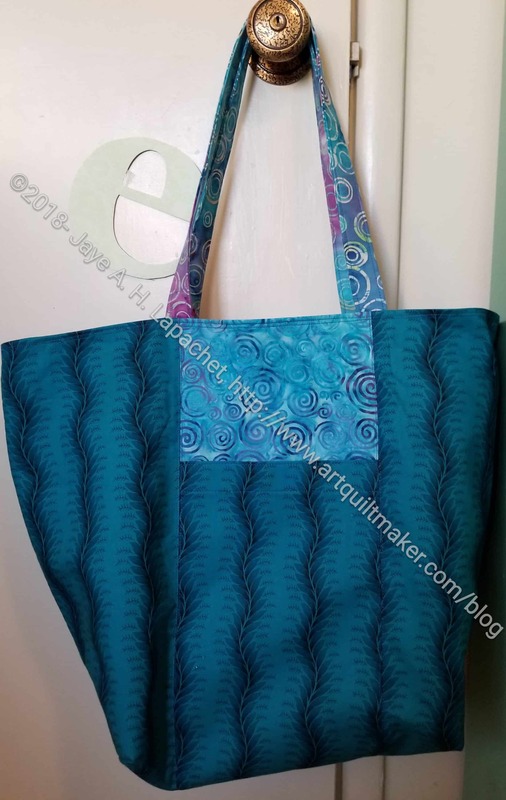 I decided to make another Jane Market Tote for the gift. It is a good pattern – useful and nicely shaped. I am also familiar with it since I made over a dozen of them since I bought the pattern. The other bonus was that a shopping bag was on the giftee’s list. As I said, I cut out the pieces on Friday night. I also decided to try adding some ShapeFlex stabilizer to see if that would give it some body. As an aside: Have I said how much I like ShapeFlex? I love it. It is so easy to work with. It is not thick. Now, I am almost out again and am now thinking of buying a bolt. Crazy? Anyway, I was able to put ShapeFlex over all the pieces except one, so I was really ready to sew on Saturday morning. So, Saturday morning, which was really about 11am since I slept so much, I sewed. The bag went together really well. I tried very hard to make it look nice. 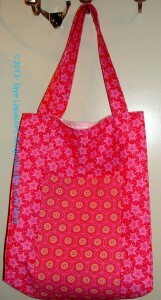 I used a star pattern on my machine to finish the top of the bag. 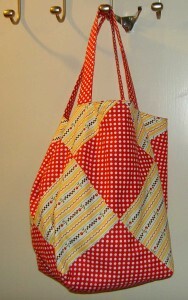 I also put the handles inside rather than outside after the bag is finished, as the pattern suggests. It is a nice bag, but I also decided to make a little needlecase and put that in the bag as well. I know it is not necessary, but I have some leftover scraps from the bag. I also found a pattern in Modern Patchwork for a needlecase that doesn’t look too difficult. Stay tuned for that. Yes, I should have been working on the Stars for San Bruno #3 quilt, but I didn’t. these bags were cut out and I just wanted to get them out of my hair. I believe that these are the last two Jane Market Totes I need for Christmas. I counted three times as I was rearranging bags to take this photo and came up with the right number. I have to check with DH to make sure I know about everyone who needs one. If these are the last ones, I would just like to point out that it isn’t even December much less the 24th of December and this part of the gift giving process is done! I feel like these came out the best of all of the bags. I put some fusible interfacing on the bottom of the bag (after I cut out the corners) and that gave them a little more shape. August 1 marks the beginning of the long slow slide to Christmas for me. I know you are running away and screaming ACK! when you hear that (except for those of you who don’t celebrate and are just sitting back and laughing right now), but it is true. I am working away on gifts for Christmas after learning that it is much better to get them done early rather than staying up until the crack of dawn on the 23rd. I am not as organized as Quiltin’ Jenny, but I am getting better! 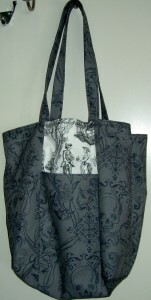 I finished two more of the Jane Market Totes over the long weekend. I made some progress while my main machine was in the shop since it doesn’t matter much about consistent seam allowances (between machines) on these bags. I know they look the same. 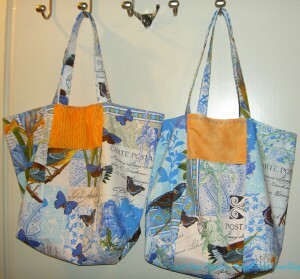 I used all the same fabrics for the outsides, but they really are two different bags. I have 4 more to make. I inadvertently counted Grama’s Birthday gift as one of the Christmas gifts. Oops! I also remembered to box the corners on these, which I am really happy about. Not sure why I had the mental block on that, but, perhaps it is over? Last year on my trip down to Long Beach, one of the many fabric stops we made was at Hart’s Fabrics in Santa Cruz. In case, I didn’t mention it back then, it is a great store. Great service, lots and LOTS of great fabric, indie patterns, notions, laminated cottons, embellishments, everything a girl could want. While there, I saw some skull fabric that was sort of a canvas or home dec fabric, but smooth and not really heavy. I thought I might have trouble sewing it, but the print was so great I knew my sister would love a bag made from it. I intended to make it for Christmas, as her birthday had passed by the time I got home from the trip. Didn’t do it. The fabric sat and stared at me. Sharona, owner of New Pieces and solver of all problems point out the skull toile to me when I was in the shop a few weeks ago. Suddenly this project came together. I made the bag in a few hours. Now I just have to grab Lil Sissy so I can give it to her. Cut fabric for Jane Market Tote patterns from Michael Miller’s French Journal collection. Started Teacher Pillow block for 8th grade science teacher. Made a Double Pinwheel block for my Sampler class. Finished binding on Frosted Stars Leftovers. See Finished blog post. Started binding on Frosted Stars. Sewed bricks together for second quilt like Purple quilt. Started NSGW pillow tops. These will be used to raise money for Cleft Palette issues through the Native Sons Charitable Foundation, to which you can also donate, if you want. Pressed, and cut fabric for FOTY 2011. Yes, I am working on it. I’ll have to take some photos of the patches to show you. This is in addition to cooking, laundry, writing, Facebooking, etc. I really like the Martha Negley giant vegetable prints. I am not sure why except that they are really different. This one was a much darker color than I thought when I bought it (online), which I mentioned when I made this pattern back in October. I was a little unsure what I would do with it. This tote bag pattern is great! It is a good size and it is a useful size. I sew the straps a little differently than the pattern suggests, because I prefer the straps to be inside the seam. 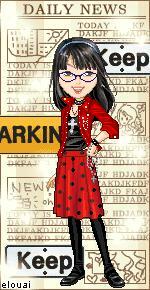 Otherwise this is a very clever pattern that goes together relatively easily and quickly. I also think large scale fabrics show up very well on this pattern design.I finally learned to put the contrast fabric behind the pocket! TFQ likes to use the same fabric for the middle panel, but I like the way I have done it in the picture. I hope I remember to do it that way next time! I have an idea in my head to make one of these a month all year. We will see: two months down, 2 bags complete. My next wishlist item for this pattern is to make a bottom out of the fusible Timtex like stuff that Anna Maria Horner uses for the Multi-tasker tote and insert that to give the bag some stability. This fabric was really a pain to cut. I cut it raw edge to raw edge, because I wanted the coffee cups to be right side up when I carried the bag. It really took a long time to cut, as a result. I am pleased, however with the results. I wish I had switched the pocket fabric and the front panel fabric, but the colors go together, so I am ok with the way it turned out. I do have to sew up the opening on the inside that I used to turn the bag. 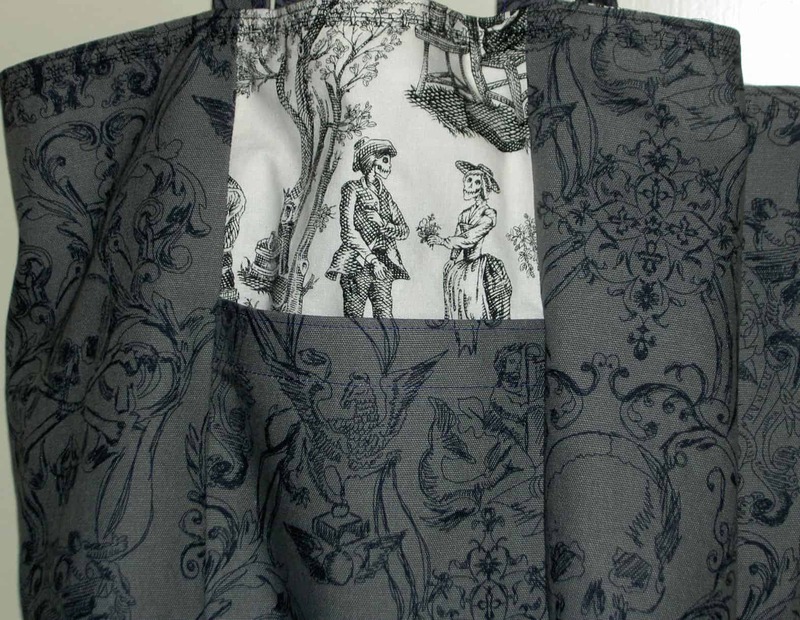 I am not working on one in the Martha Negley black vegetable print that I used before. 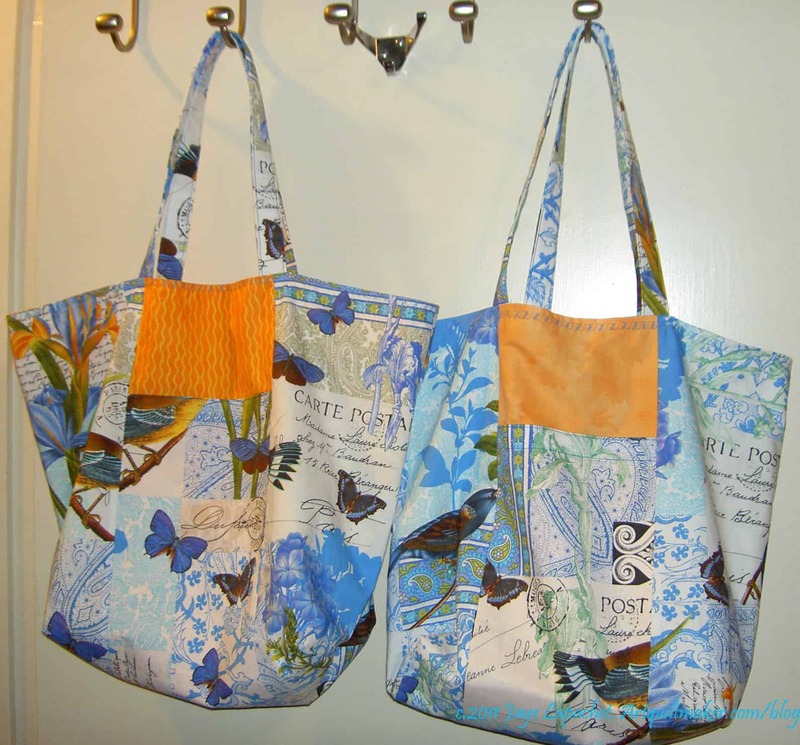 I wanted to use up that fabric in the black for these style of bags. I am trying to decide if I will make enough of them to give as gifts at Christmas. Shock, horror, I know, but I have to start thinking about it now, because I have to make 12 or so if I do decide to make them. TFQ and I spent a fewer days at PIQF this year, because we wanted to sew. I think that was a good choice, though we didn’t really find a quilt we wanted to make together. I enjoy it when we work on blocks together. I always learn a lot and think we do good work together. 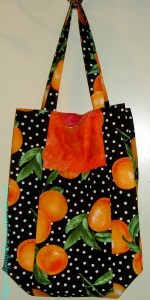 As I mentioned I bought a bag pattern called Grab Bag from Sandy’s Designs. I wasn’t able to find a website, but I found it at the Cranberry Quiltworks booth. 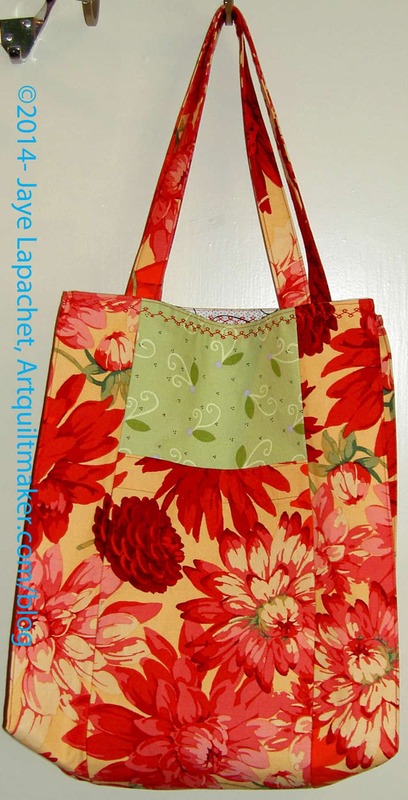 When we returned, I worked on this bag and got advice from TFQ while she pressed fabric. When looking at the bag from this angle, it is a great bag. I thought this pattern was a little bit fiddly. I didn’t really like making the patchwork for it. 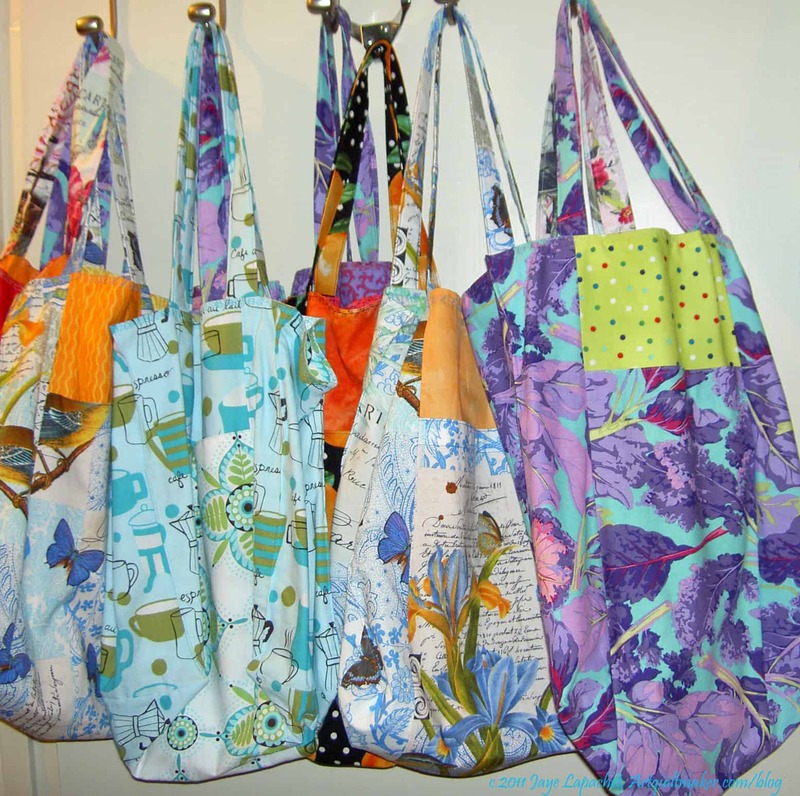 I think that is just a personal preference and not a problem with the bag pattern. Fortunately the designer gives directions on making the bag with longer strips. I want to try that. 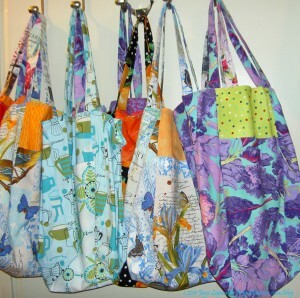 If I make these in any large scale way, I wouldn’t make a patchwork inside. The designer gives options for different sizes and ideas for fabric placement. The triangles used in the bag are all half square triangles. They are cut in that manner so that the bias is along the hypotenuse. The top of the bag is no exception. 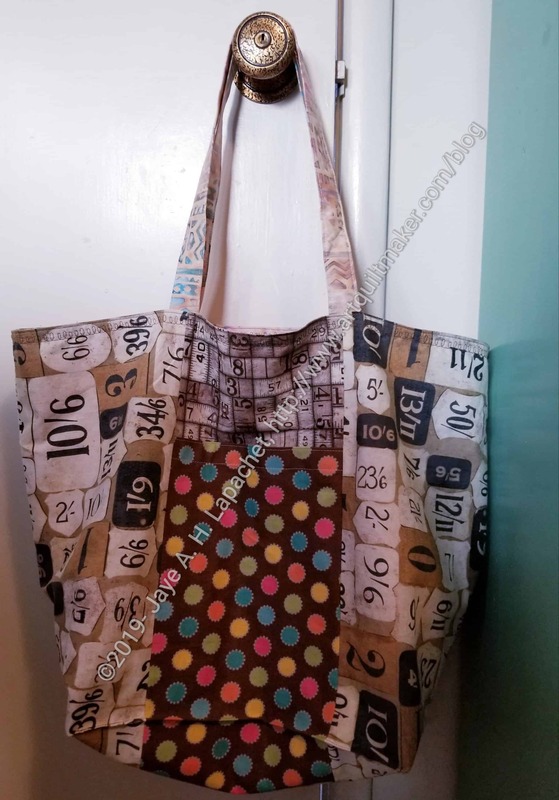 I think the pattern would be stronger if the designers suggested that people cut those pieces in the manner of cutting quarter square triangles so that the bias is not along the top of the bag. Granted, the makers sews the top right away. The bag looks good in the photo, because I stuffed it full of batting to make it look good. I am not sure I like the unstructured nature of the bag as a whole. I am also having a hard time imagining how I would use it. It would be a good gift bag. I added a little batting to the handles, too, and applied them using the method described in the Chubby Charmer pattern. I also, finally, tried the Jane Market Tote pattern from Posy Gets Cosy. The pattern is a downloadable PDF, so you can go right now and buy it. I bought the Martha Negley fabric some weeks ago. I had been searching for the violet colorway, which I found. At the same time, the shop also had this black colorway. I couldn’t tell if it was black or a very dark purple before I bought it. When it came, I found the colorway to be a little grim. 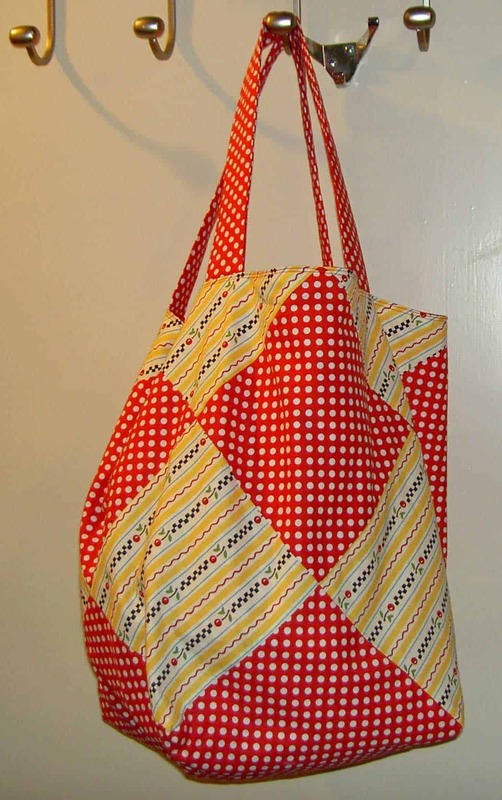 Still, it is a good fabric for tote bags, especially for boys moving out on their own. I do like the design of the vegetables scattered over the fabric. Anyway, TFQ has made a number of these bags. She uses them as the wrapping for gifts when she gives new parents receiving blankets. 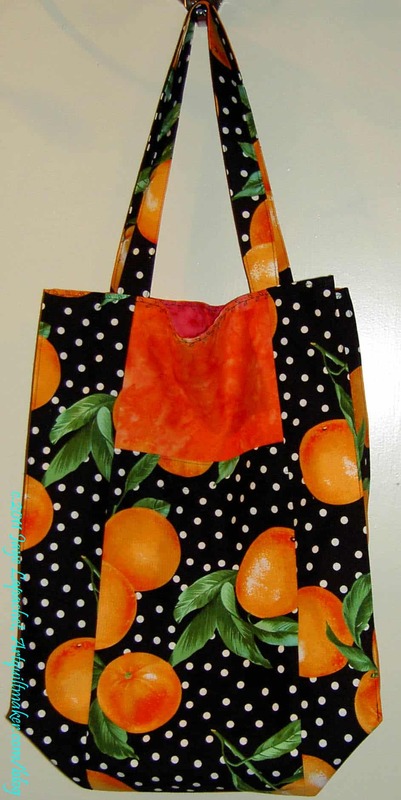 She encouraged me to make the bag while she was here, so I could ask her questions. I learn a lot better when someone shows me what to do as opposed to trying to figure things out from reading a pattern. This is a great pattern. Lots of good instructions, no mistakes or weird things happening with the instructions. There are some nice little touches the designer uses to make the pattern a little more finished. I do want to use some interfacing in the bottom just to give it a bit more structure. I’ll try it out and see how that works for me. I think the bag is a little small. It is much smaller than a grocery bag. In a way that it is good, because it means I won’t fill it up completely and not be able to carry it. I applied the put them on applied the handles using the method described in the Chubby Charmer pattern. 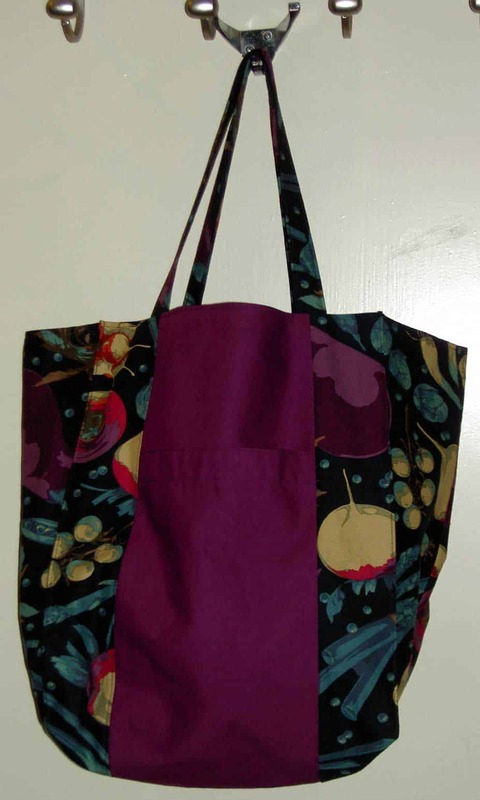 I plan to make a few more of those bags with the black Martha Negley fabric.